Firstly, prepare the image file on your computer. Use something like Irfanview to crop it to size. Changing its resolution will change its display size. Now edit the article you want to add the picture to. button to find the image file on your computer. Now go to the text box Files will be uploaded in: and type in a folder name that exists, eg floor. This will be the destination folder. 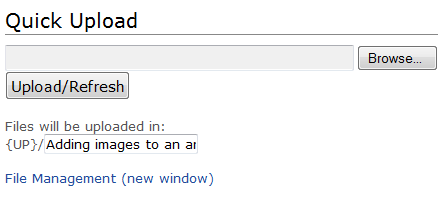 You may need to use the File Management (new window) link to view what folders are available or to create a new one. This loads your image file onto the server in the right folder. You can also go into the folder on the File Management page and upload pictures from there. - Now insert the curser where want your image and click the green image button in the toolbar. - Decide which positioning option you want and enter a title for the picture. use the Inline option in the Insert a Window dialog box being sure to leave a blank line before and after the code. If you wish to edit the code directly, each image in a folder has its link displayed in the File Management window and is available to be copied and pasted into the code. Even if you do not wish to use a caption, you can not delete its associated vertical bar. If you are using screenshots from SMath a font of 10 is usally used. Go to the Screwturn wiki Page Editing page for more details. When naming a folder, one often uses only lowercase in the name with no punctuation. Each wiki page on SMath generally uses its only separate folder. Do not end your folder names with underscores, _ .